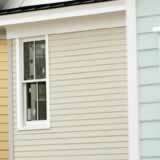 Siding prices vary depending on materials, labor and maintenance. The first thing you should consider, though, is what style you'd like to create for your house. Considering every angle before the boards fly may keep you from running into decision-making road blocks throughout the process. Knowing what you want before the project starts can ensure the end product is what you envisioned. Perhaps the worst price to pay, no matter material costs, would be installing something you do not like. One way to avoid this outcome is to look at plenty of samples. Another option is to stroll through neighborhoods and check out different siding materials, including vinyl, manufactured wood, fiber cement, real wood and stucco. What stands out to you? What look are you most drawn to? Once you decide which material best suits the style you're looking for, then you can begin to consider pricing adjustments. Getting quotes from multiple contractors can help you determine how much you should budget for your project. Price depends on geographic location, individual contractor and material quality. For instance, thicker fiber cement and vinyl will likely be more expensive in initial costs. However, higher-quality materials should require less maintenance, which can lower the costs over time. Comparing material choices with quotes can help you better determine how to budget your project, but the time taken in the beginning to research siding--prices, colors, and materials--can mean your overall happiness with the end product.